Belton, Texas – The University of Mary Hardin-Baylor will host its 11th Annual Watson Scholars’ Day on Monday, April 8, inside the Bawcom Student Union on the UMHB campus. 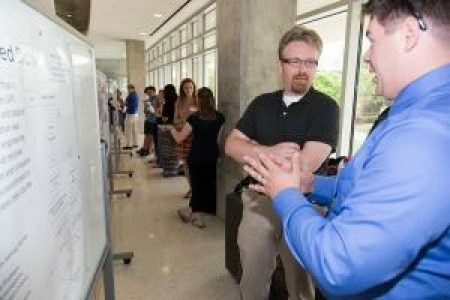 Sponsored by the UMHB Office of Research, Watson Scholars’ Day showcases outstanding undergraduate and graduate research projects and papers. More than 50 posters, papers, and creative works will be exhibited. This event is free and open to the public. Student papers will be presented from 9 a.m. to 10:20 a.m. in in the McLane Great Hall. Student researchers will be present from 10:30 a.m. to 11:50 a.m. for a poster session in the lobby of the McLane Great Hall on the 3rd floor of the Bawcom Student Union. These posters and papers represent student research from across all UMHB’s academic disciplines. Consequently, the projects cover a wide variety of subjects. For example, poster presentations include topics like the effectiveness of treating acne with essential oils, an examination of various vitamins, and an assessment of STAAR tests as they relate to special education students. Likewise, research papers explore a broad range of topics from sleep habits and their relationship to athletic performance to a comparative study of transitional services offered to youth as they age out of foster care. Scholars’ Day seeks to give UMHB students the experience of making a professional presentation. Students are required to complete all the steps that would be necessary to present at a conference, including identifying a research topic, conducting research, completing an application form, writing an abstract, and ultimately creating a poster or paper presentation and giving it publicly. For a full listing of projects and more information, visit the Watson Scholars’ Day website.